Background: Studies on anti-inflammatory and antimicrobial agents remains a challenging and important area in medicinal chemistry research due to more toxic and rapid development of resistance against first effective drugs. 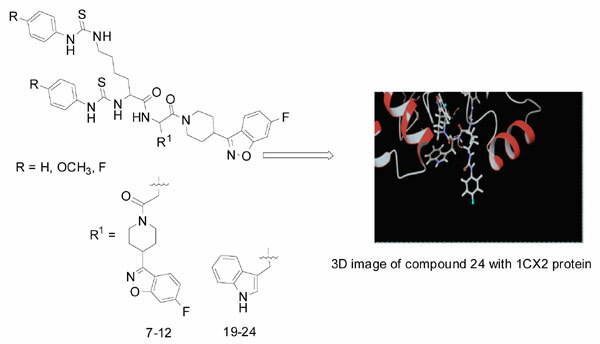 In search of novel anti-inflammatory and antimicrobials agents, bisthiourea derivatives of dipeptide conjugated to 6-fluoro-3- (piperidin-4-yl)benzo[d]isoxazole were synthesized. Methods: The peptides were synthesized by solution phase method and conjugated to 6- fluoro-3-(piperidin-4-yl)benzo[d]isoxazole using 1-ethyl-3-(3-dimethyl aminopropyl)carbodiimide (EDCI)/hydroxybenzotriazole (HOBt) as a coupling agent and N-methylmorpholine (NMM) as a base. The protecting group, 2-chlorobenzyloxycarbonyl (2-ClZ) and tertbutyloxycarbonyl (Boc) were deblocked and further reacted with substituted phenyl isothiocyanates to obtain bisthiourea derivatives. Results: The molecules 1-24 were examined for their in vitro anti-inflammatory activity by employing human erythrocyte suspension test and it was found that the IC50 values of 9, 12, 21 and 24 were lower than the IC50 of standard references indomethacin and ibuprofen. Further, all the molecules were also evaluated for their in vitro antibacterial and antifungal activities against various pathogens of human origin by agar well diffusion method. In addition, binding interaction of active molecules (7-12 and 19-24) was performed on active site of cyclooxygenase-2 (COX-2) and Staphylococcus aureus (SA) TyrRS showing good binding profile. Conclusion: Molecular docking result, along with the biological assay data, revealed that the compounds containing electron withdrawing group (F) on phenyl ring of thiourea moiety were potential anti-inflammatory and antimicrobial agents. Keywords: Anti-inflammatory, antimicrobial, bisthiourea, bisthiourea derivatives, conjugation, molecular docking. Keywords:Anti-inflammatory, antimicrobial, bisthiourea, bisthiourea derivatives, conjugation, molecular docking. Abstract:Background: Studies on anti-inflammatory and antimicrobial agents remains a challenging and important area in medicinal chemistry research due to more toxic and rapid development of resistance against first effective drugs. In search of novel anti-inflammatory and antimicrobials agents, bisthiourea derivatives of dipeptide conjugated to 6-fluoro-3- (piperidin-4-yl)benzo[d]isoxazole were synthesized. Th17-Related Cytokines in Inflammatory Bowel Diseases: Friends or Foes? Can Modulating Inflammatory Response be a Good Strategy to Treat Neuropathic Pain?